Hello, everyone! Its been awhile since my last post but I’m back once again. Today I’m going to be talking about the new game that came out recently and that is Kingdom Hearts 3 which was published and developed by Square Enix. This is the twelfth installment in the game series and sequel to Kingdom Hearts 2. Also, this recent game could be the very last in the series, but who knows. The story revolves around our good friends Sora, Donald and Goofy who have to go on a journey to find his own way of finding his power of awakening in order to get the rest of his powers back. Xehanort almost took over Sora completely in a previous game, but failed. Sadly, Sora lost most of his powers in the process and now has to find a way to get them back before Xehanort can carry out his evil plan. With that in mind, Sora must once again travel across worlds and find his own way of getting his powers back. In a good portion of the game, Sora’s fighting style is very weak looking and for obvious reasons. This change is not only obvious to the person playing the game, but to the characters in the story, as well. The other details that I’ve noticed in the game are the new moves and functions created within the game. There are ALOT of new moves when fighting in this game, so many that if it wasn’t for the fact that most can be activated with the triangle button (for PS4) I probably would have forgotten how to use them soon after the tutorial was finished. Make no mistake, that some of them are cool and fun to look at while others look just plain unnecessary as if they were trying to get that ultimate Disneyland feel into the game. If that is what the game developers were going for then they have succeeded. They were lots of times in mid gameplay that I felt like I teleported in a Disneyland attraction ride. Also, it seems that they have changed certain features that were present in the previous Kingdom Hearts games. For example, they’ve changed the whole layout and controls of the Gummi ship. It took me a while to figure out the ship’s new controls, but got a quick handle of them. The reason I think that they changed it up so much is to fit the new layout when using the Gummi ship. Back in the previous games, they didn’t allow the Gummi ship to move around all that much and gave it only one set destination until you found multiple worlds to go to while blasting anything or anyone that got in your way. Now, its more open world where you can either fly around and take out some heartless ships or go to wherever world you choose. Other than going to Hercules world; the story starts wherever you want it to. Thinking about the game overall, I would recommend this game for people who are into the series or beginner RPG players. Why I say beginner RPG players for this game, you ask? Well, I’ll tell you! I’ve played the Kingdom Hearts 3 game in standard mode thinking that I’ll have a tough time against higher level monsters and bosses like I did in the previous games. That was not the case for the latest game, if you want a real challenge in the game then I suggest going with the proud option because even though the settings say easy, standard or proud. It was really saying do you want super easy, easy or normal because I remember playing normal on the previous games and I was struggling even in the beginning, but in Kingdom Hearst 3 not so much. It was more like a come and enjoy the ride type of feel as I was playing. Not that there is anything wrong with going on with an easy setting and enjoying the story and their awesome graphics. I truly love the story in this series and I truly hope this isn’t going to be the last one that they make, but who knows what happens in the future. This game has its ups and downs, but like with every Kingdom Hearts game I still enjoy it so much and I hope you will, too. A long time ago, I talked about the game Danganronpa and the second game, as well. Well, this time, I’ll talk about the third game, too. Also, I’ve been hearing that an exciting fourth game is going to come out sometime soon in January of next year. I’m really excited to see what they end up brining to the table this time around considering what happened last time in the second game. In case some of you didn’t know or remember what happened in the last game. 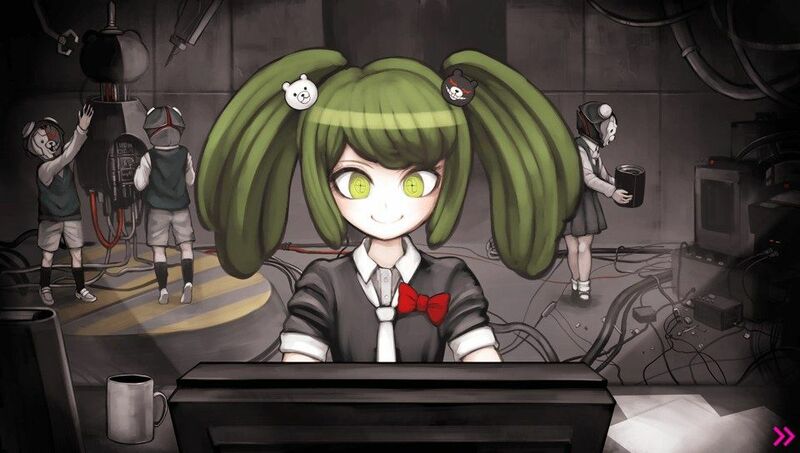 The last surviving students of the killing game, eventually, discover that their in a virtual world and the mastermind, Junko Enoshima, is trying to download her mind into their bodies so she can control the world in different bodies. Together we end up destroying her once and for all and get released from the virtual world. It was a very nice ending and all, I really enjoyed the second game but those two games left behind a lot of questions that needed answering and luckily for us the game’s developers decided give us some answers with the game Danganronpa: Ultra Despair Girls. I really liked this game because it was different from the last two game because this one was an adventure/shooter game. Also, it not only shows how the chraracters from the previous game are doing but it fills a lot of holes that were left behind by the two last games. So, that was pretty good. Ultra Despair Girls was happening after the first killing game in the first game was over. One of questions left behind in the game was…..what happened to Makoto’s family? Not going to reveal what happened to all of them but his sister Komaru is the main character in this game as she tries to survive the city filled with killer robots and homicidal children. This shooter game is a real nice change of pace with a story just as good as the other ones. Moving on from that, we have the upcoming release of a fourth game. When I heard this I was wondering what was going to happen since the mastermind is dead and her successor went away. But, once I saw the cover I already had a guess what was going to happen, you see the little girl a little more grown up on the cover, so it looks like she’s going to return to wreak havoc and have one last showdown. I’m telling you guys I’m so excited about this game and you already know that I’m going to one of the first people to buy this game the moment I find out that its out.